The Walker Corporation’s $500 million private commercial and retail development at the Adelaide Festival Plaza has been approved by the Development Assessment Commission (DAC). The DAC concluded that the development would bring a range of uses including retail and commercial, which would extensively activate the space during the daytime and the evening, and help to revitalise and rejuvenate the plaza as a desirable place to visit. The 27-storey office tower will involve the demolition of the existing plaza and the car park, but once completed will include up to three levels of retail development and five levels of parking. "The Walker Corporation’s development will be a key feature of the transformation, which also includes a $90m refurbishment of the Adelaide Festival Centre, a new entry to Adelaide Railway Station, a new plaza and northern promenade," Minister for Housing and Urban Development Stephen Mullighan said. The state government is contributing $180 million towards the Adelaide Festival Centre and Festival Plaza redevelopment with a $40 million contribution from Walker Corporation. According to the Australian Financial Review, Lang Walker said the project, expected to start in 2017, would become a major drawcard for Adelaide and attract national and international businesses. 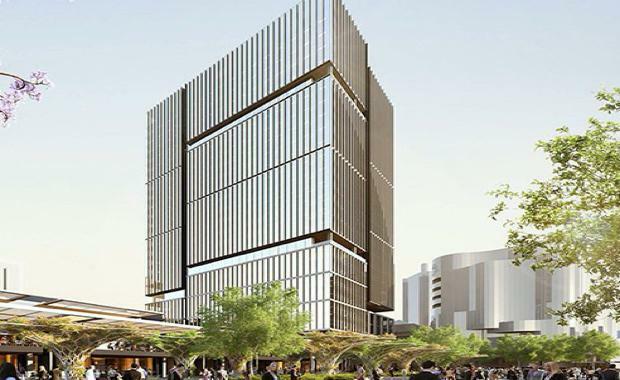 Walker Corporation will start a pre-leasing program for the office tower, which according to the group will include "continuing discussions with a number of major South Australian tenants". The project involves demolishing a 300-bay car park, making way for the underground car park, as well as replacing existing surface parking in the adjoining parklands. The DAC approval does not include the public realm, which is subject to a separate application by DPTI approved under the crown development application process. The precinct will link Adelaide's premier Riverbank attractions such as the Adelaide Oval, the Adelaide Festival Centre and the Adelaide Casino.